The new Apple iPads are both expected to be officially introduced at an event next week, and the iPad mini 2 and iPad 5 are highly anticipated tablets. Today we have some news about the iPad 5 and mini 2 gold prospects as well as a new Smart Cover for the iPad 5. Although nothing has yet been confirmed about either of these devices we have seen an increasing amount of leaks over the last few weeks. Some have involved leaked images and a recent video leak also purported to show casings from the iPad 5 in a new Space Gray option. Gold colored iPads have been rumored since the arrival of the gold iPhone 5S, and the new Space Gray tablet spot seemed to back this up further as it suggested the new iPads might have the same color options as for the latest premium iPhone. 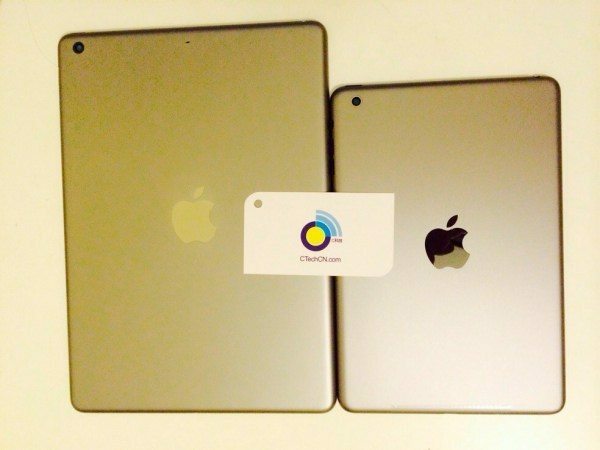 Now some further leaked images have appeared that do indeed appear to show the iPad 5 in gold, as well as the iPad mini 2. Although these latest images cannot be verified they do come from a source that has previously been reliable. Another thing to consider is that the gold color shown may have been created by some weird lighting illusion, but they certainly look pretty gold to us! In more iPad news it seems that if you were hoping to use a current iPad case for the new iPad 5 you’ll be out of luck. Everything we’ve seen so far about the iPad 5 tells us it will be narrower and slimmer and styled more like the iPad mini. This ties in with a research note issued by Cantor Fitzgerald analyst Brian J. White’s who feels that Apple will be revealing a new Smart Cover for the iPad 5. White now anticipates the iPad 5 will be around half to three quarters of an inch narrower than previous full-sized iPads, citing discussions with suppliers in China and Taiwan. This also fits with previous schematics that we reported on. After attending recent trade shows White also noted that new iPad cases and covers to fit the claimed dimensions of the iPad 5 were being sold by several vendors. Given this information the analyst believes that Apple will also launch its own new Smart Cover and this will bring about a new upgrade cycle for its line of cases. White pointed to these accessories having a good profit margin and ultimately suggests that previous iPad cases will not be suitable for the iPad 5. In the same research note White also reinforces the idea of a gold iPad 5, saying that he expects the new iPad to come in the same colors as the iPhone 5S. Essentially if you’re hoping to purchase an iPad 5 or iPad mini 2 in gold then it looks as though your wish is about to be granted. However, it also appears that you will not be able to use your existing iPad cover for the new iPad 5. While we wait for next week’s Apple event and the official launch of the new iPads we’d like to hear your thoughts. Do you think new color options including gold for the iPad 5 and iPad mini 2 will tempt more people to upgrade? Maybe you were hoping that you wouldn’t also have to splash out for a new case for the iPad 5? Let us have your comments on this.